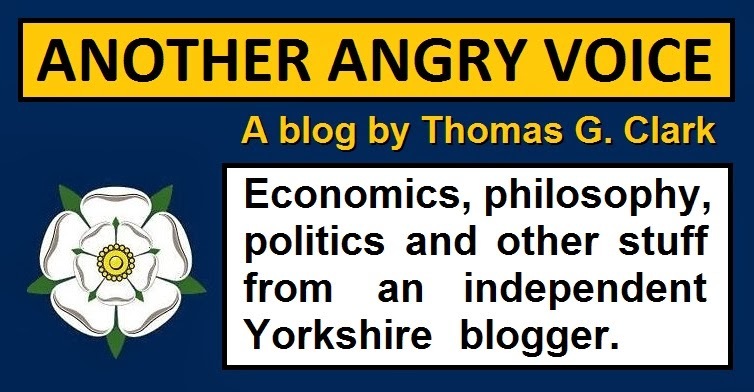 What are the likely consequences of Tory electoral fraud? Despite efforts by swathes of the mainstream media and the political establishment to starve the Tory electoral fraud allegations of coverage, it keeps on getting bigger. 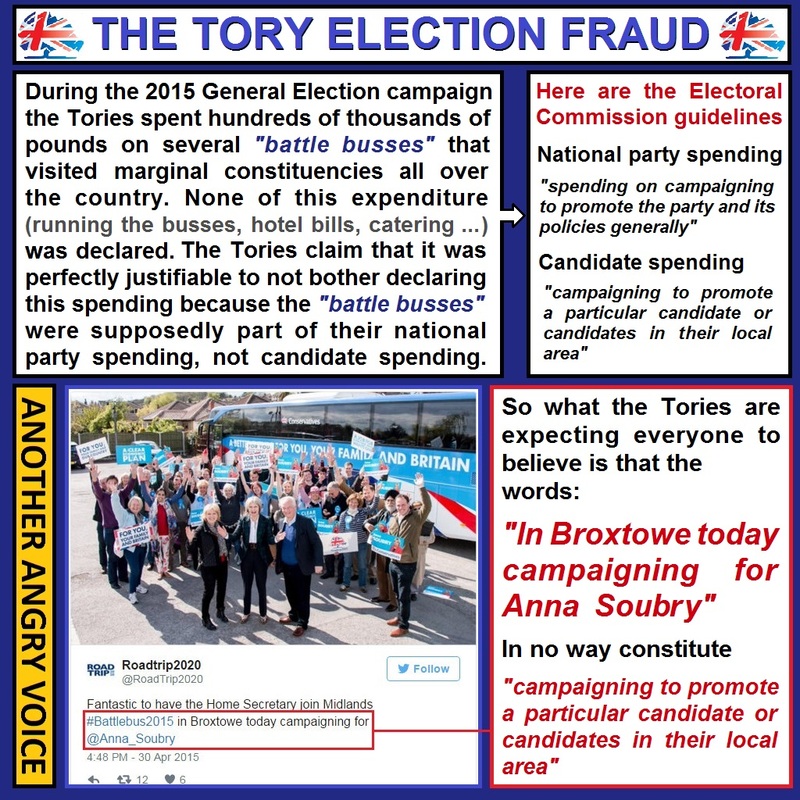 The Electoral Commission had to take the unprecedented step of resorting to the courts to demand documentation that the Tory party had been trying to hide from their investigation, more than a dozen police forces have initiated enquiries into fraudulent Tory campaign spending, leaked emails show that senior Tory figures (Lynton Crosby, Andrew Feldman, and Stephen Gilbert) approved the decision to pass off local campaign spending as national expenditure, and more questions are being asked about other local Tory election expenses in marginal constituencies that the party failed to declare as constituency spending. Despite concerted efforts by many in the media and the political establishment to downplay, dismiss or ignore the electoral fraud story, it looks like it is definitely not going to go away. However there is still absolutely no guarantee that action will be taken to punish the perpetrators and beneficiaries of the electoral fraud. In this article I'm going to consider some of the most likely, and most unlikely consequences are. It is a criminal offence to commit electoral fraud and if found guilty the punishment can be up to a year in jail or unlimited fines. There's plentiful evidence that the Battle Bus teams were campaigning for particular candidates in their local areas (see image), so short of a complete whitewash, there's little chance that the Tories are going to get away scot free. The Tory approach to the electoral fraud scandal seems to be to claim that it's all just some innocent administrative mix up. This kind of excuse looks an awful lot like they are preparing the ground to throw some lowly administrator under the (battle) bus. 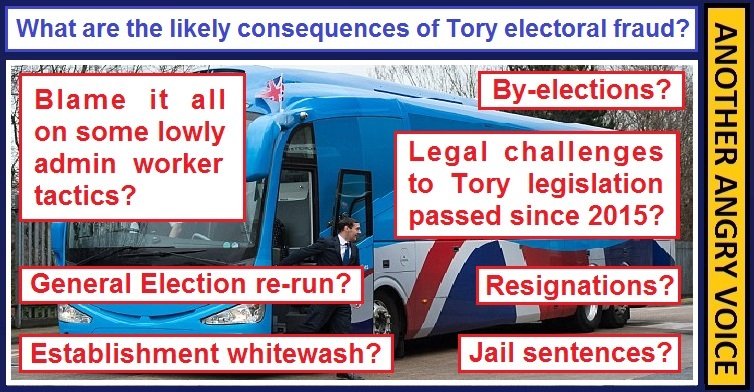 The problem with this age old strategy of pinning the whole scandal on some lowly minion within the organisation is that the leaked email about the Battle Bus clearly implicates the Tory party treasurer Andrew Feldman, the deputy treasurer Stephen Gilbert and the recently knighted Tory party election strategist Lynton Crosby, because they all signed off on the plan to miscategorise the Battle Bus spending as national party spending rather than candidate spending. The emails make it absolutely clear that they signed off the plan to avoid declaring the Tory Battle Bus expenses (running the bus, catering, hotel bills ...) as local spending, even though the entire purpose of the Battle Bus campaign was to tip specific marginal constituencies in their favour. It doesn't matter if these senior Tories try to plead ignorance about UK electoral law becuase "I didn't know it was a crime" has never been an acceptable defence in any court of law. Ignorance of the law does not magically render unlawful actions lawful, especially if it is the actual job of the accused (two party treasurers and an election strategist) to ensure that the party complies with electoral law. "I didn't know it was a crime" is clearly not a defence, but alongside a guilty plea it could certainly be used in mitigation. If the Tories pull off their attempt to dismiss the whole thing as an "administrative error" it's highly unlikely that anyone will ever end up going to jail for it, because an establishment whitewash of the whole affair is still a possible outcome. Even if the allegations are proven, it's unlikely anyone would go to jail for it unless they are found guilty in court after trying to contest the charges, rather than pleading guilty and accepting a few fines and suspended sentences. 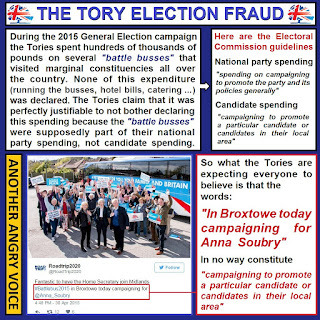 Several people have tried to argue that the Tory electoral spending fraud should trigger a re-run of the General Election, but in my view this would be an unfair consequence. The Daily Mirror investigation revealed that the hidden Tory campaign spending would have pushed some two dozen constituencies over their campaign spending limits. Even if another ten or twenty additional constituencies get dragged into the scandal over other issues (like undeclared spending on adverts in the local press, undeclared spending on campaign leaflets, or undeclared expenditure on flying in of Republican Party activists activists from the US) a re-run of the General Election would clearly be extremely unfair on the 600 odd MPs who complied with electoral law when they won their seats. For example, why on earth should the 56 SNP MPs in Scotland have to re-contest their seats as a consequence of a spate of Tory electoral fraud in England? In my view a full re-run of the General Election would constitute punishment of the majority of innocent MPs for the crimes of a small minority of guilty MPs who gained unlawful advantage from undeclared campaign spending. A fairer course of action would be to hold By-elections in any constituencies where the sitting Tory MP benefited from electoral fraud. If the allegations of Tory electoral fraud are proven, this could result in By-elections in 20 or more constituencies, which would be more than sufficient to end the Tory majority in the House of Commons assuming enough people were to vote against the Tory candidates who cheated their way into the House of Commons. If it turns out that twenty or more Conservative MPs benefited from electoral fraud in winning their seats, there could be some very interesting legislative consequences. If these politicians entered the House of Commons by fraudulent means, any legislation that was passed as a result of their votes could clearly be seen as having been fraudulently imposed on the public. The situation is clearly unprecedented, so I'm not exactly sure of the legal grounds for overturning legislation that could have been passed as a result of Tory electoral fraud, but if the Tories are found guilty of electoral fraud, I can't see any reason why legal efforts couldn't be made to overturn legislation that made its way through the legislative process as a result of votes by people who cheated their way into parliament. The Tories would like nothing more than to have the whole electoral fraud scandal brushed under the carpet as some kind of innocent administrative error, while possibly pinning the blame on some lowly minion. Until the leaked email detailing how the Battle Bus plans had been signed off by senior Tory figures came to light, an establishment whitewash and sacrifice of a lowly scapegoat seemed to be the most likely outcome. Now that senior Tory figures are clearly implicated, it might be a lot more difficult for them to whitewash the whole affair or pin the whole fraud on some lowly admin worker. If the complaints are upheld it seems likely that By-elections would have to be held in any constituency where campaign spending limits were broken. It would be extraordinary if people who cheated their way into power were allowed to continue reaping the benefits of their fraudulent activities. Whether the constituencies would reject the Tory candidates who cheated their way into office is another matter. It would only take the loss of seven or so Tory seats to put an end to the Tory majority in the House of Commons, however it's likely that they would still be able to cling onto power by seeking the backing of the likes of the DUP, UUP (who are already affiliated to the Tory party) and the UKIP MP Douglas Carswell. Whether it would be possible to overturn legislation that was passed with the backing of MPs who cheated their way into the House of Commons is an interesting legal question, and one that will definitely need to be asked if the allegations of Tory electoral fraud are proven. The difference between "left" and "right"